The Pierce-Gate topology shown in Figure 1 is the most ubiquitous circuit for quartz crystal oscillators. It is simple and elegant with its low parts count. However, if not properly designed, it can be detrimental to a product. Most designers are familiar with the Pierce-Gate topology but few really understand how it functions, let alone how to properly design it. As a common practice, most don’t even pay too much attention to the oscillator in their design until it does not function properly, usually already released to production. This should not be the case. Many systems or projects have been delayed in their deployment because of a twenty-five cent crystal not working as intended. It is the opinion of the author that the oscillator should receive its proper amount of attention during the design phase and not during the manufacturing phase. The designer would also avoid the nightmare scenario of product being returned from the field. A simple analysis of how the Pierce-Gate oscillator functions will be done by breaking it down to its components. A much more rigorous analysis is beyond the scope of this paper. However, the simple analysis will suffice to convey the key points the author intends to teach. In addition, a simple design problem will be presented to teach how to arrive at the Pierce-Gate initial values. a) The product of the gains around the loop must be equal to or greater than one at the desired frequency of oscillation. b) The phase shift around the loop must be zero or any integer multiple of 2π (360°). Figure 2 shows the phase shift analysis for the Pierce-Gate. If U1 provides -180° phase shift, an additional -180° by the rest of the external components is required to satisfy the Barkhausen criteria. The phase shift will automatically adjust itself to be exactly 360° around the loop in order to keep oscillating. If U1 provides -185° phase shift, the rest of the components will automatically provide -175° phase shift in a properly working design. Since Xc = 1/jwc, the negative resistance (gain) goes up as the capacitors C1 and C2 are reduced. Hence, decrease C1 and C2 to increase the gain around the loop. It is easy to see that Rs decreases the gain around the loop as its value is increased. A starting value for Rs is to set it equal to the reactance of Xc2. The feedback resistor Rf is there to linearize the digital CMOS inverter. Rf accomplishes this feat by charging the inverter’s input capacitance, including C1 from the output of the inverter. In other words, the feedback resistor transforms a logic gate into an analog amplifier. Pretty neat trick by simply adding a single resistor. With no external components connected (C1, C2 and X1), measure the voltage at the input and output of the inverter. If the feedback resistor is inside, then the voltage at the input and output pins will be around Vcc/2. If the feedback resistor in not inside, then the inverter will be latched and either the input and output will be at a logic “1” or logic “0” or visa versa. The value of Rf used is frequency dependent. The lower the frequency, the higher the value needed. Table 1 lists typical range values. With the crystal and all other components in place, determine the value of Rf which begins to pull the frequency. Do this by plotting frequency vs. Rf. Choose the value of Rf above the point where loading begins to pull the frequency. 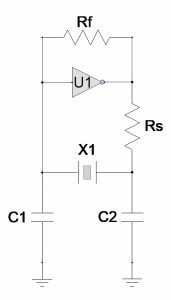 1) To isolate the output driver of the inverter from the complex impedance formed by C2, C1 and the crystal. 2) To give the designer another degree of freedom to control the drive level (expressed as power/voltage across or current through the crystal) and/or adjust the oscillator loop gain. Rs must be used with “Tuning-Fork” (watch) crystals. Tuning-Fork crystals have a maximum drive level of 1µW maximum. Without a large Rs (greater than 10k ohms), the inverter will physically damage the crystal! 3) In conjunction with C2, Rs forms a lag network to add additional phase shift necessary, especially at low frequencies, 8 MHz or below. This additional phase shift is needed to reduce the jitter in the time domain or phase noise in frequency domain. Rs is sometimes not needed (especially at frequencies above 20 MHz) since the output resistance of the inverter in conjunction with C2 will provide enough phase lag. However, when not be needed to phase lag it may still be needed to reduce the drive level on the crystal. The inverter U1 provides the necessary loop gain to sustain oscillation as well as approximately –180° phase shift. If the inverter is part of some ASIC or microprocessor, its manufacturer should specify the critical crystal parameters like maximum E.S.R that will work properly under all conditions. If U1 is not part of an ASIC, then the designer must carefully select an inverter with the proper gain/phase characteristics for the targeted frequency or range of frequencies. Simulation is also strongly recommended here, but not necessary for a good working design. Not all digital inverters are suitable for oscillator applications. Some have too much propagation delay even at low frequencies. On the other hand, it used to be that one needed an inverter with no buffer (un-buffered) for oscillators. This is not the case today since propagation delays have been reduced over the years for all modern digital inverters due to the higher speeds of operation needed. A call to the inverter manufacturer’s technical support department is a good idea to get their blessing (in a sense) of your intended use of it as an oscillator. As mentioned above, the crystal X1, together with C1, C2 and Rs provide an additional -180° phase lag to satisfy the Barkhausen phase shift criteria for sustaining oscillation. In most cases, C1 is set equal to C2. However, if need be, C2 can be made larger than C1 by a few standard values and set the center frequency and/or increase the loop gain. There is step-up in voltage gain that is function C2/C1. 3) No factory adjustment of components to meet the +/-50 ppm calibration spec. The inverter gate is part of a microprocessor with Cin = 4 pF and Cout = 9 pF. The feedback resistor Rs is not internal as shown in Figure 1. The microprocessor manufacturer has already determined that a crystal with an E.S.R = 40 ohms maximum will provide reliable operation at this frequency. Find: C1, C2, Rs, Rf and specify the crystal. First let us choose a value for Rf. This component is not critical for this design and can be within 470k~5 Meg ohms at this frequency, as listed in Table 1. Therefore, choose Rf = 1 Meg ohm. The value of C1 and C2 together with Cin and Cout of the inverter (see Fig. 3) will set the load capacitance requirement on the crystal. For a clock design, you want to have the load capacitance specification of the crystal to be about the standard values of 18 or 20 pF. These are the two most common load capacitance values in the crystal industry. Most designers tend to neglect Cin and Cout either because they don’t know they are there or because it is not listed in the inverter data sheet. These are significant in value compared to the external ones (C1 and C2). If Cin and Cout are not specified, then a guess value of 5 pF for each is a good start. The circuit can be later optimized by changing the starting values of C1 and C2. In a Pierce-Gate oscillator, you want to set C2 equal to C1, or C2 greater than C1 by one or two standard values. After a few iterations using equation (7.2) and assuming 3 pF for the pcb strays, we can get C1 = C2 = 27 pF for our initial values. Therefore, specify the crystal’s load capacitance as 20 pF. This is a nice equation since it gives us how far off frequency the oscillator will be at room temperature for every 1 pF we are away from the 20 pF load due to component variation and/or tolerance. The problem here is that the equation requires the motional and shunt capacitances, which we don’t have. However, we will complete the problem assuming a margin for the calibration. Once the crystal is ordered, request the motional parameters from the crystal manufacturer to check if the assumption that was made is good enough. The typical commodity crystal used in this type of CLOCK has a Trim Sensitivity range of -15 to -30 ppm/pF. We will assume the high end of this range to give ourselves a +/-30 ppm margin on the calibration spec. for the crystal. Therefore, we set the crystal calibration spec to (50-30) or +/-20 ppm. Once you obtain the actual data (C0 and C1) from the crystal manufacturer, you can check if this margin is good enough using the Trim sensitivity equation with the tolerance of the components being used. Production test data of the center frequency should be analyzed and if necessary, adjust C1 and/or C2 of the Pierce oscillator. The tighter you make the calibration spec on the crystal, the higher the price. Today, a commodity crystal is calibrated in the range of +/-25 to +/-50 ppm at room temperature. The load capacitance also directly affects the calibration spec and price. As you can see in the Trim Sensitivity equation, as CL is made smaller, the Trim Sensitivity number goes up. Hence, a 10 pF load crystal is much harder to calibrate than a 20 pF load crystal given the same design. So a bad scenario for a crystal manufacturer is a 3 pF load capacitance with a +/- 10 ppm calibration requirement. We set it to 390 ohms, the standard 5% value. The crystal type needs to be an AT-cut since a BT-cut cannot meet the +/-40 ppm (+/-40 ppm for some margin) frequency stability over the temperature range of -20°C to +70°C. This gives us an initial specification minus the package of the crystal. For this, we give the information on the crystal at hand to the crystal manufacturer, requesting the lowest cost SMD crystal that will meet your electrical and mechanical specs. Figure 3: Pierce-Gate showing interal Input and Output capacitances. Cin ranges from 4pF to 7pF; Cout ranges from 7pF to 12pF. The exact values are rarely listed on the data sheet of the inverter. Shunt Capacitance (C0): 7 pF max. In general, the higher the volumes of the product, the more attention should be paid to the oscillator validation. It may become necessary at times to determine if a crystal oscillator is functioning while still soldered down on a “mother” board. This may seem to be a trivial thing to test for, but if the incorrect test procedure and/or equipment is used, false results/conclusions may be reached. Is the oscillator functioning at all? That is, is the oscillator sourcing an output waveform? Is the frequency of the oscillator within the frequency calibration number stated in the data sheet? The combination of the probe and oscilloscope are designed for a specific overall input measuring bandwidth. Measuring a signal outside this bandwidth will give erroneous measurements, especially in the shape and amplitude of the signal. For example, a square wave signal at 100 MHz will require (as a rule-of-thumb) five times the bandwidth as a minimum. Hence, a scope and probe combination with 500 MHz or greater bandwidth will be required to measure a 100 MHz square wave signal. Similarly to bandwidth, for accurate Rise and Fall times measurements, the scope and probe combination must have a Rise time specification of at least three times faster than that of the pulse being measured. Manufacturers of quality oscilloscopes will specify the bandwidth and Rise time at the probe tip for the scope and probe combination. Probes have a tip capacitance (Cp) ranging from 100 pF to less than 1 pF, depending on the model. However, most probes today have about 11 pF tip capacitance. In addition to this tip capacitance, probes have a tip resistance (Rp) of either 1 or 10 mega-ohms. 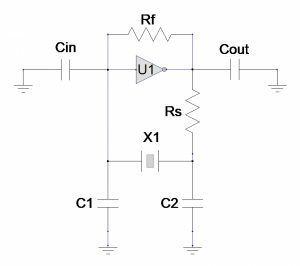 As far as measuring a crystal oscillator with a CMOS output waveform, the 1 or 10 mega-ohms probe tip resistance is never an issue. However, the tip capacitance value is very much a concern. For example, an oscillator rated to drive a 15 pF load when probed with a 11 pF tip will usually give wrong measurements results at high frequencies like 100 MHz. Keep in mind that we are trying to pass 500 MHz for a 100 MHz square wave signal. At 500 MHz, the 11 pF tip capacitance is an “AC Short.” The solution to this problem is to use a FET (field effect transistor) scope probe that has less than 1 pF tip capacitance with a bandwidth of five times greater than the square wave signal.